Hereford Society of Model Engineers01989 562988work Miniature RailwayThe Hereford Society of Model Engineers was started in Hereford in 1962, with the aim of building a miniature railway. The society has grown over the years and now has its own multi-purpose site at Broomy Hill, catering for all forms of model engineering. Situated adjacent to the Waterworks Museum, a visit to Broomy Hill on one of our “Public Running Days”, makes for an enjoyable day for all the family. There is plenty of space for parking (it’s free too) and pleasant surroundings to enjoy a picnic. FREE Access and Parking on public running days. 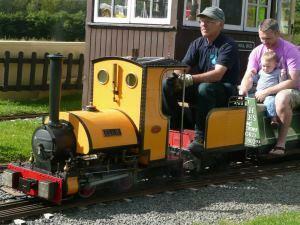 To find out when we are open to the public check out the website or Facebook (HSME - Broomy Hill Railway). New and prospective members are made very welcome. Just turn up to a meeting or event and introduce yourself to a friendly face. The Hereford Society of Model Engineers was started in Hereford in 1962, with the aim of building a miniature railway. We are only open to the public on Running Days, for dates see our website or Facebook page - HSME - Broomy Hill Railway. •At the traffic lights before the Wye river bridge use the right hand lane to turn right into Barton Road. •At the traffic lights after the Wye river bridge use the left hand lane to turn left into Barton Road. •400m along Barton Road, immediately after the old railway bridge, turn left into Broomy Hill Road. •A further 500m on, the entrance to Broomy Hill Railway is situated off Broomy Hill Road. It's down a short track shared with the Waterworks Museum. This track is on the Google map and is clearly signposted. Find the old bridge, near the Cathedral down Bridge Street, or Gwynne Street for the historically minded. Cross the river, turn right and walk west along the south bank. When you come to the track heading towards the Waterworks Museum follow it for 50 yards, we are on the right.